The Polikarpov I-16 was a Soviet fighter aircraft of revolutionary design; it was the world's first cantilever-winged monoplane fighter with retractable landing gear. The I-16 was introduced in the mid-1930s and formed the backbone of the Soviet Air Force at the beginning of World War II. The diminutive fighter prominently featured in the Second Sino-Japanese War, the Battle of Khalkhin Gol and the Spanish Civil War-where it was called the Rata (Rat) by the Nationalists or Mosca (Fly) by the Republicans. The Finnish nickname for I-16 was Siipiorava ("Flying Squirrel"). Full scale work on the TsKB-12 prototype began in June 1933 and the aircraft was accepted into production on 22 November 1933, a month before it took to the air. The TsKB-12 was of mixed construction using a wooden monocoque fuselage and wings based around a KhMA chrome-molybdenum steel alloy wing spar, dural ribs and D1 aluminum alloy skinning on the center and leading edges, with the remaining portions of the wings fabric covered. Another modern feature were the ailerons which ran almost the entire trailing edge of the wing and also operated as flaps (in the manner of more modern flaperons) by drooping 15�. The cockpit was covered by a 40 cm (16 in) wide canopy which featured an Aldis tubular gun sight which could slide back and forth on runners fitted with bungee cords of rubber. A 225 l (59.4 US gal) fuel tank was fitted directly in front of the cockpit. The main gear was fully retractable by a hand-crank. The armament consisted of a pair of 7.62 mm (0.30 in) ShKAS machine guns in the wings, mounted on the outboard side of the main gear and carried 900 rounds of ammo. These features were proposed at first by Andrei N. Tupolev, however the NII VVS was more concerned about the stresses a typical combat aircraft was subjected to in combat, and initially considered the risk too great. However TsAGI, with the help of the 3rd Design Brigade under the leadership of Pavel O. Sukhoi and Aleksandr P. Putylov eventually convinced NII VVS that what was being proposed was not only feasible, but would enhance the aircraft's performance. The TsKB-12 was designed around the Wright Cyclone SR-1820-F-3 nine cylinder radial engine (rated at 529 kW/710 hp); a license to build this engine was being negotiated. As the license was not yet approved, Polikarpov was asked to settle for the less powerful M-22 (Soviet-built version of the Gnome-Rhone Jupiter 9ASB which itself was a licensed version of the Bristol Jupiter VI ) with 358 kW (480 hp). This was deemed acceptable because the projected top speed still exceeded 300 km/h (185 mph). Service trials of the new fighter, designated I-16, began on 22 March 1934. The M-22 prototype reached 359 km/h (223 mph). The manually-retracted landing gear was prone to jamming and required considerable strength from the pilot. Most of the test flights were performed with the gear extended. On 1 May 1934, the M-22 prototype participated in the flyover of the Red Square. Approximately 30 I-16 Type 1 aircraft were delivered, but were not assigned to any V-VS fighter squadron. Most pilots who flew the I-16 Type 1 for evaluation purposes did not find the aircraft to have many redeeming characteristics. Regardless of pilot opinion, much attention was focused on the Cyclone powered aircraft and the M-25 (the license built Cyclone). On 14 April 1934, the Cyclone prototype was damaged when one of the landing gear legs collapsed while it was taxiing. The third prototype with a Cyclone engine incorporated a series of aerodynamic improvements and was delivered for government trials on 7 September 1934. The top speed of 437 km/h (270 mph) no longer satisfied the Air Force, who now wanted the experimental Nazarov M-58 engine and 470 km/h (290 mph). Subsequently, the M-22 powered version entered production at Factory 21 in Nizhny Novgorod and Factory 39 in Moscow. Because it was the fourth aircraft produced by these factories, it received the designation I-16 Type 4. Aircraft fitted with these new engines required a slightly changed airframe, including armor plating for the pilot and changes to the landing gear doors to allow for complete closure. The M-25 fitted I-16, the I-16 Type 5, featured a new engine cowling which was slightly smaller in diameter and featured nine forward facing shuttered openings to control cooling airflow, a redesigned exhaust with eight individual outlet stubs, and other changes. The M-25 was rated at 474 kW (635 hp) at sea level and 522 kW (700 hp) at 2,300 m (7,546 ft). Due to the poor quality of the canopy glazing, the I-16 Type 5 pilots typically left the canopy open or removed the rear portion completely. By the time the Type 5 arrived, it was the world's lightest production fighter (1,460 kg/3,219 lb), as well as the worlds fastest, able to reach speeds of 454 km/h (282 mph) at altitude and 395 km/h (245 mph) at sea level. While the Type 5 could not perform the high-g maneuvers of other fighters, it possessed superior speed and climb rates, and had extremely responsive aileron control which gave the Type 5 a very good roll rate which lead to precision maneuvers in loops and split-Ss. Initial service experience revealed that the ShKAS machine guns had a tendency to jam. This was the result of the guns being installed in the wings upside-down to facilitate the fit. The problem was addressed in later modifications. Evaluations from pilots confirmed the experience with prototypes. Controls were light and very sensitive, abrupt maneuvers resulted in spins, and spin behavior was excellent. A barrel roll could be performed in under 1.5 seconds (roll rate over 240 degrees/second). The machine guns were fired via a cable and the required effort, coupled with sensitive controls, made precision aiming difficult. The rear weight bias made I-16 easy to handle on unprepared airfields because the aircraft was rather unlikely to flip over the nose even if the front wheels dug in. The canopy tended to become fouled with engine oil and the moving portion was prone to slamming shut during hard maneuvers which caused many pilots to fix it in the open position. 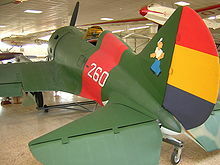 Picture - I-16 in Spanish Republican colors with "Popeye" mascot"
At the start of Spanish Civil War in 1936, Republican forces pleaded for fighter aircraft. After receiving payment in gold, Joseph Stalin dispatched around 500 I-16 Type 5s and Type 6s. The aircraft immediately began dominating the enemy Heinkel He 51, Arado Ar 68 and Fiat CR.32 biplanes, and remained unchallenged until the introduction of the Messerschmitt Bf 109. 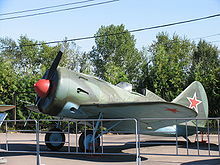 A number of aviation publications called the new Soviet fighter a "Boeing" due to the incorrect assumption that it was based on the Boeing P-26's design. The Nationalists nicknamed the stubby fighter Rata (Rat), while the Republicans affectionately called it Mosca (Fly). Combat experience showed that the I-16 had deficiencies; several aircraft were lost after structural failure of the wings which was quickly remedied by reinforced structures. Heavy machine gun bullets could sometimes penetrate the armored backrest and fuel tanks occasionally caught fire in spite of being protected. The hot Spanish climate required the addition of oil radiators, and dust adversely affected the life of the engines. Although some aircraft accumulated up to 400 hours of flying time, the average life of an I-16 was 87 days, of which one sixth was spent on maintenance. The biggest complaint in service was the light armament of only two 7.62 mm (0.30 in) machine guns. This was urgently addressed with Type 6 which added a third ShKAS in the bottom of the fuselage. The four-gun Type 10 was nicknamed "Super Mosca" or simply "Super". Another 250 I-16 Type 10 were supplied to China. This model added a second set of 7.62 mm (0.30 in) ShKAS machine guns, armor behind the pilot, and had a slightly upgraded 560 kW (750 hp) M-25 engine. In 1939, these aircraft fought against the Japanese, fighting the fixed-landing gear equipped Nakajima Ki-27 Nate of the IJAAF and IJNAF's Mitsubishi A5M Claude. Further large scale action took place in fighting between the Soviet Union and Japan in the Battle of Khalkhin Gol in 1939. The next year, the Imperial Japanese Navy introduced the A6M Zero which was more than a match for the I-16. Further attempts were made to upgrade the firepower of the aircraft using 20 mm (0.79 in) ShVAK cannons, making the I-16 one of the most heavily armed fighters of that moment, able to fire 28 pounds of ammunition in three seconds. Pilots loved the results, but the cannons were in short supply and only a small number of I-16 Type 12, 17, 27, and 28 were built. The cannons adversely affected performance with the 360� circle time increasing from 15 seconds in Type 5 to 18 seconds. Type 24 replaced the skid with a tailwheel and featured the much more powerful 670 kW (900 hp) Shvetsov M-63 engine. Type 29 replaced two of the ShKAS guns with a single 12.7 mm (.50 in) UBS. Types 18, 24, 27, 28, and 29 could be equipped to carry RS-82 unguided rockets. A 1939 government study found that I-16 had exhausted its performance potential. Addition of armor, radio, battery, and flaps during the aircraft's evolution exacerbated the rear weight distribution to the point where the aircraft required considerable forward pressure on the stick to maintain level flight and at the same time developed a tendency to enter uncontrolled dives. Extension and retraction of the landing flaps caused a dramatic change in the aircraft attitude. Accurate gunfire was difficult. By 1941, the I-16 was still the most numerous Soviet fighter and made up about two-thirds of the VVS. The Red Army pilots nicknamed the aircraft Ishak (Russian: Ишак, Donkey/Hinny) because it was similar to the Russian pronunciation of "I-16." The I-16 performance was generally equal to that of the Messerschmitt Bf 109 (of the era) at altitudes up to the 3,000 m (9,843 ft), where the I-16 could fight the Messerschmitt Bf 109 '"Emil" on equal terms in turns and had a more durable engine than the liquid-cooled engine of the Bf 109. In cases where the pilots ran out of ammunition, they would ram enemy aircraft. 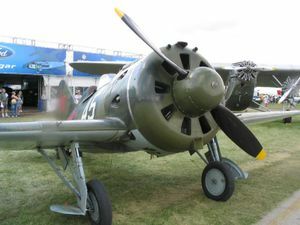 The I-16 was slightly more maneuverable than the early Bf 109s, but the Bf 109 could use its advantages in slashing, climbing and diving attacks to bring an I-16 down. Skilled pilots took advantage of its superior horizontal maneuverability and liked the aircraft enough to resist the switch to more modern fighters. Around half of all produced I-16s were still in service in 1943, when they were finally replaced. Specially modified I-16s were used in the Zveno parasite aircraft experiments using the Tupolev TB-3 mothership. The Luftwaffe was known to have captured some I-16s and UTI-4s two-place trainers (two of which were marked with the Stammkennzeichen codes DM+HC and DM+HD) and flown from Rechlin by Kampfgeschwader 200 (KG 200). The Luftwaffe was not the only air force able to test its fighters against the I-16; the Japanese captured a few I-16s as well. and the Romanian Air Force also got one when a Soviet pilot defected. The Finnish Air Force (FAF) captured along with several other Soviet types, some I-16s. During the Winter War and the Continuation War, the Finns captured six I-16s and one I-16UTI. Two of the captured I-16s and I-16UTIs were put back into flying condition and flight tested. There is considerable disagreement in literature on features of particular I-16 variants. This list is based on the following references. Picture - Russian Polikarpov UTI-4 a two seater training version of I-16 Soviet fighter. Russia 1941. TsKB-12 First prototype, M-22 engine, 336 kW (450 hp), two unsynchronized ShKAS machine guns in the wings with 900 rpg. TsKB-12bis Second prototype, Wright SGR-1820-F-3 Cyclone engine, 533 kW (715 hp) TsKB-12P (I-16P) Prototype armed with two ShVAK cannon in the wings, 150 rpg. TsKB-18 Ground attack prototype with M-22 engine and armored cockpit. Armed with four ShKAS or PV-1 machine guns and 100 kg (220 lb) of bombs. Two additional Type 5s were fitted with six ShKAS machine guns of which four could decline to 20� for ground strafing. TsKB-29 (SPB) Pneumatically-operated landing gear and flaps, Wright Cyclone engine, armament of two ShKAS machine guns, used as a high-speed dive bomber in the Zveno project I-16 Type 1 Pre-production series, M-22 engine with 358 kW (480 hp). I-16 Type 4 First production version, M-22 engine. I-16 Type 5 Type 4 with a streamlined and tapered engine cowling, Shvetsov M-25 engine with 522 kW (700 hp). I-16 Type 6 M-25A engine, 545 kW (730 hp). I-16 Type 10 Four ShKAS machine guns (two synchronized in the fuselage and two in the wings), windscreen replaced the sliding canopy, could be fitted with retractable skis for winter operations, M-25B engine with 560 kW (750 hp). Hispano-Suiza-built aircraft were powered by the Wright Cyclone R-1820-F-54 engine. I-16 Type 17 Type 10 with two ShKAS machine guns and two ShVAK cannon, rubber tail wheel, M-25V engine with 560 kW (750 hp). Some aircraft were fitted with an additional 12.7 mm (0.5 in) Berezin UB machine gun for strafing. I-16 Type 18 Type 10 with Shvetsov M-62 engine producing 620 kW (830 hp), with a two-speed supercharger and a variable-pitch propeller. Capable of carrying two 100 l (26 US gal) underwing fuel tanks. I-16 Type 20 Four ShKAS, first version capable of carrying underwing fuel tanks with 93 l (25 US gal) capacity based on tanks used on the Japanese Nakajima Ki-27, 80 built. I-16 Type 24 Four ShKAS, landing flaps replaced drooping ailerons, tailwheel added, second cockpit door added on the starboard side, Shvetsov M-63 engine with 670 kW (900 hp). I-16 Type 27 Type 17 with an M-62 engine. I-16 Type 28 Type 24 with two ShKAS and two ShVAK. I-16 Type 29 Two synchronized ShKAS in the nose and a single 12.7 mm (0.50 in) UBS in the bottom of the fuselage, no wing guns. Could carry 4-6 RS-82 rockets. I-16 Type 30 Re-entered production in 1941-42, M-63 engine. I-16TK Type 10 with a turbocharger for improved high-altitude performance, reached 494 km/h (307 mph) at 8,600 m ( 28,200 ft), did not enter production. UTI-1 Two-seat trainer version of Type 1. UTI-2 Improved UTI-1 with fixed landing gear. UTI-4 (I-16UTI) Two-seat trainer version of Type 5, most with fixed landing gear. Finnish Air Force operated captured aircraft. Picture - Spanish Republican Air Force "Mosca"
Polish Air Force operated one I-16 (1 Pulk Lotnictwa Myliwskiego) and two UTI-4 aircraft (15 Samodzielny Zapasowy Pulk Lotniczy and the Techniczna Szkola Lotnicza. 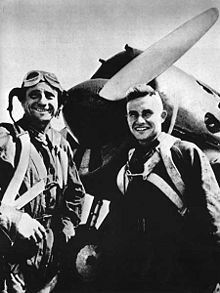 Spanish Nationalist Air Force operated I-16 and UTI-4 aircraft captured from the Spanish Republican Air Force, returned by French government and 30 built in Jerez de la Frontera. I-16s were still operated in 1952. In the early 1990s, New Zealand pilot and entrepreneur Tim (later Sir Tim) Wallis' Alpine Fighter Collection organised the restoration of six I-16s and three I-153s to an airworthy condition, this project being completed in 1999 as the third and final I-153 arrived in New Zealand. After a spectacular international debut at the Warbirds Over Wanaka airshow in 1998 (for the I-16s) and 2000 (for the I-153s), some of the aircraft were sold off around the world, to the Commemorative Air Force in the U.S. (as pictured above), to Jerry Yagen of Virginia, and an I-16 to Spain, where it is held in the collection of the Fundacix�n Infante de Orleans at Cuatro Vientos airport, Madrid, and is occasionally flown for the public. Despite intentions to keep one of each at the NZFPM, all of the I-16s have now been sold to overseas owners. Jerry Yagen also had a second I-16 restored in Russia. Finnish Aviation Museum in Vantaa, Finland, has a two-seater I-16 UTI trainer on display. Flying Heritage Collection has an airworthy I-16 Type 24. Abanshin, Michael E. and Nina Gut. Fighting Polikarpov: Eagles of the East No. 2. Lynnwood, WA: Aviation International, 1994. ISBN 1-884909-01-9. Green, William and Gordon Swanborough. The Great Book of Fighters. St. Paul, Minnesota: MBI Publishing, 2001. ISBN 0-76031-194-3. Kopenhagen, W., ed. Das grox�e Flugzeug-Typenbuch(German). Stuttgart, Germany: Transpress, 1987, ISBN 3-344-00162-0. Liss, Witold. The Polikarpov I-16 (Aircraft in Profile Number 122). Leatherhead, Surrey, UK: Profile publications Ltd., 1966. Price, Alfred. The World War II Fighter Conflict. London: Macdonald and Jane's (Publishers) Ltd., 1975. ISBN 0-356-08129-X. Shavrov V.B. Istoriia konstruktskii samoletov v SSSR do 1938 g. (3 izd.) (in Russian). Moscow: Mashinostroenie, 1985. ISBN 5-217-03112-3. Stapfer, Hans-Heiri. Polikarpov Fighters in Action, Part 2 (Aircraft in Action number 158). Carrollton, TX: Squadron/Signal Publications, Inc., 1996. ISBN 0-89747-355-8. Thomas, Geoffrey J. KG 200: The Luftwaffe's Most Secret Unit. London: Hikoki Publications, 2004. ISBN 1-90210-933-3.